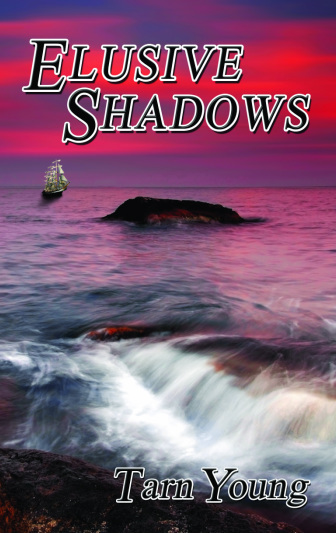 'Elusive Shadows', the second volume of a trilogy, continues the intrigue, adventure and mystery of 'Silent Torment'. The key characters pursue their diverse, yet intertwined destinies with gritty determination, until a climatic convergence of events propels the participants into a startling and unexpected conclusion. By 1855 most passenger ships on the New York/Liverpool route were commandeered for the Crimean war effort, with few available for the Atlantic run. 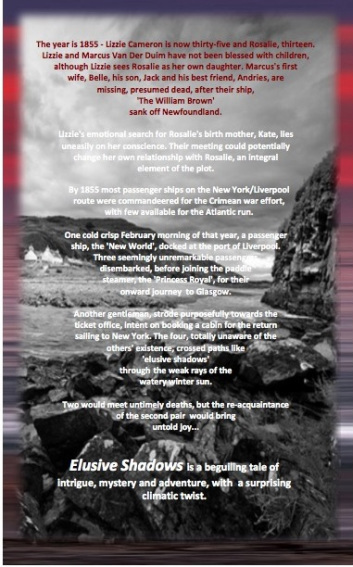 On a cold crisp February morning of that year, a passenger ship, the 'New World', docked at the port of Liverpool. Three seemingly unremarkable passengers disembarked, before joining the paddle steamer, the 'Princess Royal', for their onward journey to Glasgow. Another traveller strode purposefully towards the ticket office, intent on booking a cabin for the return sailing to New York. They crossed paths, totally unaware of the others' existence, like elusive shadows reflected in the weak rays of a watery winter sun. Two would meet untimely deaths, but the re-acquaintance of the other two would bring untold joy. The story begins in that year. Lizzie and Marcus are bringing up Rosalie (Kate's daughter), as their own. Marcus has not yet come to terms with the apparent loss of his son and estranged wife Belle, in the sinking of the 'William Brown' off Newfoundland, in 1841. (Coincidentally, the Titanic sank under similar circumstances in the same area of the Grand Banks, 71 years later). Lizzie's emotional search for Kate, lies uneasily on her conscience, as their meeting could potentially change her own relationship with Rosalie. Lizzie's brother Robert, father of Rosalie, is assisting her in this quest. Kate and her Aunt Jayne are also searching for Rosalie, a fundamental and integral element of the plot.